This is the first of a two-part series analyzing the Democratic and Republican vice presidential possibilities. This week, we'll look at likely Democratic nominee Hillary Clinton's choices, and then we'll assess presumptive Republican nominee Donald Trump's options next week. The Hippocratic Oath is the prime directive for doctors, but to us it also provides good guidance for vice presidential selection. Running mates often make very little difference in the election one way or the other, which can be an argument for making a safe, noncontroversial selection. Often, attempts to make a bold vice presidential pick can fall flat: For instance, John McCain's outside-the-box selection of then-Alaska Gov. Sarah Palin gave his ticket a quick shot of adrenaline, but it's hard to argue Palin ultimately helped McCain (in fact, the opposite is probably closer to being true). But as Hillary Clinton considers her options for the second slot on her ticket, she has to consider not only the harm that could be done to her November prospects by a poor selection -- she has to also be concerned about the harm done to her governing prospects. That's because many of her best potential running mates are members of the U.S. Senate, and selecting one of them could imperil a future Democratic Senate majority -- either in 2017 or beyond. One of Clinton's strongest choices could be Sen. Sherrod Brown (D-OH). Brown is one of the more liberal members of the Senate and is a favorite of labor unions. While he endorsed Clinton in the Democratic primary, selecting Brown could be an olive branch to Bernie Sanders' supporters because Brown sees eye to eye with Sanders on certain issues, including sharing his skepticism of free trade agreements. To the extent that running mates help in swing states, Brown could also be worth a point or two in Ohio, a state that has been a key to Republican presidential success. It's very hard to see Donald Trump winning the White House without Ohio -- if he did, he'd be the first Republican in the history of the party (going back to 1856) to do so. However, there's one major problem with Clinton selecting Brown: Gov. John Kasich (R-OH) would appoint Brown's replacement, and he would pick a Republican (probably his ally, Rep. Pat Tiberi, who holds what used to be Kasich's House seat, based northeast of Columbus). Brown himself will have a hard enough time holding his seat when it is next contested in 2018, against Tiberi or state Treasurer Josh Mandel (R), who unsuccessfully challenged Brown in 2012. If Tiberi runs as an incumbent in 2018, the seat might be gone for the foreseeable future. 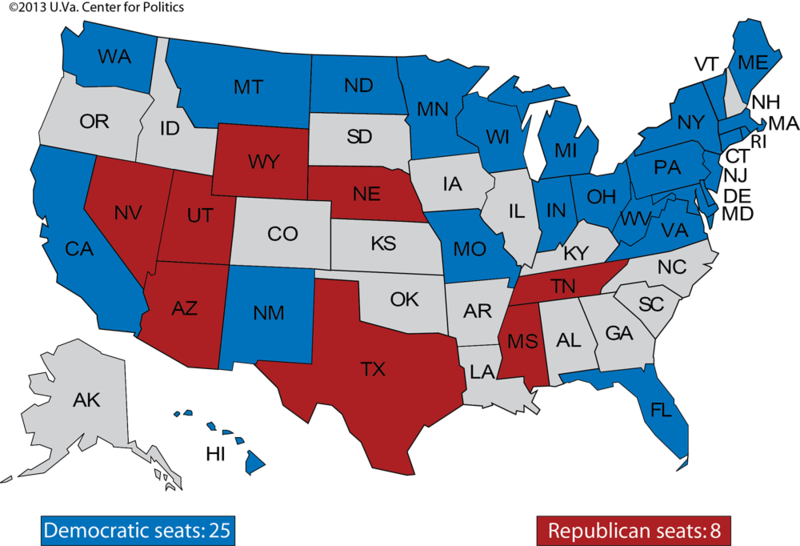 In close to three-quarters of the states -- 36 of 50, according to the National Conference of State Legislatures 1 -- the governor fills Senate vacancies until the next statewide election (in other words, just like Ohio does, although the specific rules vary). Most of the remaining states, like Massachusetts, allow for a temporary Senate appointment but also mandate a special election for the remainder of the unexpired term. 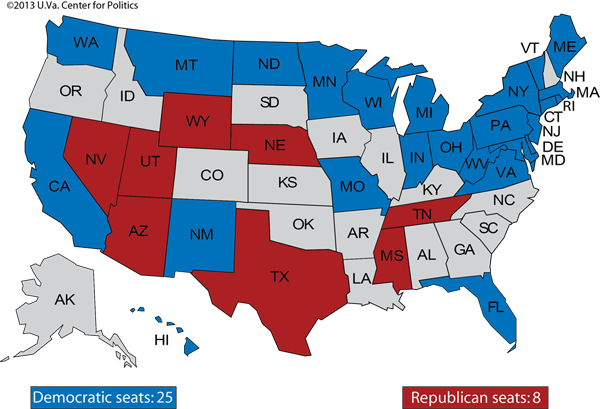 Democrats are greatly overextended on the 2018 Senate map, as they control 25 of the 33 seats up for election. Additionally, they have to defend five seats in states that now favor Republicans at the federal level: Indiana, Montana, Missouri, North Dakota, and West Virginia. In a bad midterm environment, Democrats could easily lose all five, just like they lost all seven Senate seats they held in states where Mitt Romney won going into 2014's midterm. Additionally, Democrats will be defending seats in Florida, Ohio, Pennsylvania, Virginia, and Wisconsin, among other potentially vulnerable seats. Given how midterm years often break against the president's party, it's not hard to imagine the Democrats having a poor election in 2018 with Clinton in the White House. That makes every Senate seat crucial, and it could impact whether Clinton picks a senator as her running mate. Sens. Bill Nelson (D-FL) and Martin Heinrich (D-NM) could be decent running mates, but they, like Brown, would cost the Democrats a Senate seat. Picking Sen. Cory Booker (D-NJ) would cost the Democrats a Senate seat, too, but a special election would fill it later in 2017 (Democrats would be favored to win that election, just like Booker did in initially capturing his seat in a 2013 special election). Gov. Charlie Baker (R-MA) could appoint a temporary replacement for Sen. Elizabeth Warren (D-MA), but a Democrat would have a good chance to win the seat back a few months into 2017. Even if a Republican wins Vermont's governorship, the same would be true for Sen. Bernie Sanders' seat if Clinton were to select her presidential rival. The winner of the gubernatorial race in Missouri would be able to fill Sen. Claire McCaskill's seat until 2018, though if elevated to VP perhaps she could resign early so outgoing Gov. Jay Nixon (D) could make the pick. Finally, either of Minnesota's two Democratic Senators -- Al Franken or Amy Klobuchar -- could be attractive picks in part because Gov. Mark Dayton (D) would appoint a Democratic replacement, although a vacancy would set up a 2017 special election. Because of the potential Senate control complications presented by almost all of these senators, Clinton may look outside of her old stomping grounds in the upper chamber for a running mate. The Texas Twins -- Department of Housing and Urban Development Secretary Julián Castro and U.S. Rep. Joaquín Castro -- are possibilities as Democrats seek to lock in the Hispanic vote against Donald Trump, who has horrific numbers with this growing slice of the electorate. However, there are legitimate questions as to whether either is too green for the job. Lesser-known but more experienced Hispanic possibilities include former Interior Secretary Ken Salazar, previously a Democratic senator from Colorado, and Labor Secretary Tom Perez. Yet Salazar is not very liberal, and Clinton's pick will ideally satisfy Sanders' voters, while Perez is liberal but anonymous nationally. (If the old game show, What's My Line? 2 still existed, Perez would be certain to stump the entire celebrity panel.) Former Gov. Deval Patrick (D-MA) is another nonwhite possibility, although his post-gubernatorial employer (Bain Capital, Mitt Romney's former firm) wouldn't excite the Sanders crowd. The same is true of ex-Sen. Evan Bayh (D-IN), Gov. John Hickenlooper (D-CO), and Secretary of Agriculture Tom Vilsack, a former governor of Iowa. She could even conceivably turn to the aforementioned Terry McAuliffe, a committed Clintonista and swing-state governor, though his background as a political insider and fundraiser could be problematic in the current political climate. Finally, it's possible that Clinton could emphasize continuity with the Obama administration by sticking with Vice President Joe Biden as her running mate, although that seems unlikely (hence, why Biden is the final name on our list). All in all, there are 21 names here, and given the quirks of running mate selection, it's possible that Clinton's eventual selection isn't even mentioned. At this point, though, we think Kaine stands just slightly above the rest. He comes from an important swing state, Virginia, and his elevation to vice president would not cost the Democrats a Senate seat (at least not immediately). He also has a wide array of governmental experience and probably wouldn't overly rile the pro-Sanders part of the party. In other words, we think he'd satisfy the prime directive of vice presidential selection: First, do no harm -- both to the ticket and to the Democrats' chances at a Senate majority at the opening of the next Congress. •Has been a No. 2 as VA's Lt. Gov. •Knows the job! Plus no moving expenses.